Nespresso offers ultra-convenience, yet sophisticated technology,delivers a perfect coffee, time after time and is a pleasure to use and display, and with many different machines for all different budgets and tastes there truly is something for every coffee lover. Last week I was invited along to an event celebrating the new Nespresso boutique in Edinburgh, on Edinburgh's upmarket shopping street Multrees Walk. 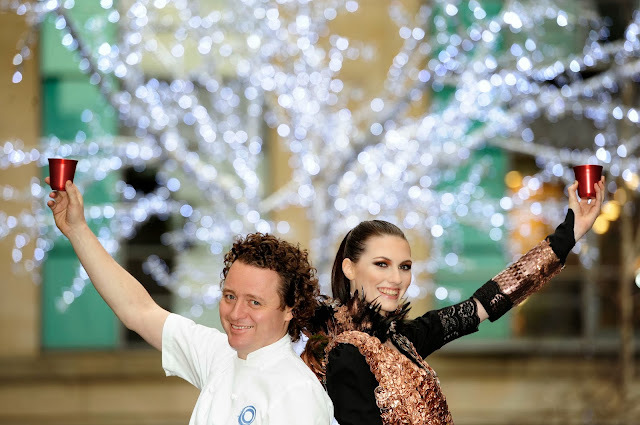 Michelin-starred Chef Tom Kitchin and Judy R Clark, award winning fashion designer, have teamed up to welcome Nespresso to Scotland as it opens its first Boutique on Edinburgh's upmarket shopping street Multrees Walk. Pictured with Tom and wearing Judy R Clark’s dress, which is made with over 1,000 recycled Nespresso coffee capsules, is model Bethany Brown. Celebrating the launch of Edinburgh’s new Boutique, Michelin Starred Chef Tom Kitchin, known for his philosophy ‘From Nature to Plate’, and Judy R Clark, acclaimed designer, have partnered with Nespresso to help welcome the brand to Scotland. A menu of recipes inspired by Nespresso’s Grand Cru coffee range has been created by Kitchin for the launch, with dishes including Roe Deer Carpaccio, Halibut Ceviche and Pumpkin and Coffee Tiramisu. Each dish has been specially matched to one of the Nespresso Grand Cru range. Tom said of the partnership: “At The Kitchin, our ‘From Nature to Plate’ philosophy means we’re absolutely committed to using the very best fresh, seasonal, local produce. The team at Nespresso share this passion, with every skill and care taken along the journey from bean to cup. “When it comes to cooking with coffee, often people assume it only works well in sweet dishes, but in fact the bold flavour goes well in both sweet and savoury recipes. As an ingredient it can work well in sauces, marinades, stocks and soups. I’ve relished creating a menu focusing on this fantastic ingredient, and the Nespresso Boutique is a great addition to Edinburgh’s city centre”. The event was the perfect opportunity to find out more about Nespresso, try some Nespresso cocktails created by Amicus Apple and taste a few dishes created specially for the event by Tom Kitchin. I really enjoyed the Halibut Ceviche with a coffee and lime glaze and dried cranberrry and also the Roe Deer carpaccio. I've even got the recipes for the taster menu, so I might even have a wee go at recreating a few of the recipes. I went to the Nespresso Coffee Conisseur Club last month where I learnt lots more about the art of coffee, tasting coffee and Nespresso itself, since then I've spent many a night googling Nespresso machines and adding them to various wishlists, and my Christmas list (fingers crossed!) If I don't get one for Christmas I think I might treat myself to one after Christmas, I can't wait for the convienence of it and the huge number of options of coffees' I'll be able to buy and try from the Nespresso boutique! Extending its unique multi-sensory retail experience to Scotland, the Boutique showcases the Nespresso range of beautifully designed machines and Grand Cru coffees as Brema Drohan, managing director for Nespresso explains: “With recent research revealing over 60% of Scots drink more than one coffee a day, the unique Nespresso retail experience will ensure that coffee drinkers in Scotland have access to some of the world’s highest quality coffee from the finest suppliers across the globe”. As well as the full selection of machines, the Boutique offers customers the opportunity to explore and enjoy the full range of 21 Nespresso Grand Cru coffees at the Tasting Bar, while Nespresso PickUp allows customer a chance to place an order and collect it from the Boutique just two hours later.